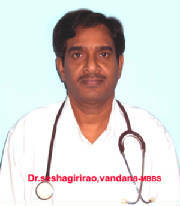 I am Dr.Seshagirirao , Vandana - MBBS,DOHM,DAc,MAMS. 1972 batch of MBBS from Andhra Medical College - Visakhapatnam (A.P)... started my medical practice at Nakka -street , Srikakulam Town by opening a small clinic in the Name of " VIJAYALAKSHMI CLINIC " ON 09-May 1980. In the year 1984 Feb.24 the clinic was shifted to newly constructed Nurshing home in the name of " VIJAYALAKSHMI NURSHING HOME "with a bed strength of 05 only . The nurshing home was re-named as "vijayalakshmi Hospital " on 01-07-2000 by increasing the bed strength to 40 . Again the hospital was re-named as " VANDANA NURSHING HOME " On 26th October 2008... as my three kids one son & two daughters became doctors and it became a combined Nursing home. The beds are reduced to 20.